Ooh! This doesn’t sound appealing at all. Thanks for the warning Jay! Your reviews are funny as something really funny but you know that already? Can you please watch True Detective (season one) if you haven’t yet and write a review about it? I know it not a movie but I just wanna read want you have to say about that now! I did watch Season 1 actually (never got around to season 2). I’d have to rewatch to write a review – my memory once fell out my ear and got run over by a Mac truck and it’s never fully recovered. I know, this part really didn’t require it so I feel like it’s just hubris on his part. This film just screamed oscar bait, I’m glad it sucked. It did & it did! Your review is probably more interesting than the film itself. The trailers did nothing for me. And now that you mentioned the tooth I’d probably be unable to look away as well. Yeah, I didn’t like the trailer, and particularly hated the bit with the tiger. It’s just random weirdness in the movie. Yeah, he looks like a movie star all right… NOT!!! Damn, Jay. I was hoping this would’ve been good. 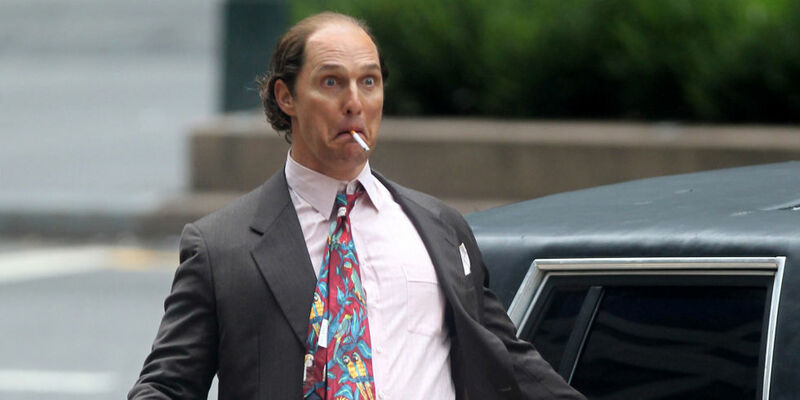 It sounds like McConaughey run of stinkers is continuing further. Maybe he’s caught the Oscar winning curse? He kind of had it before the Oscar too. Maybe the Oscar was a bit of a fluke? I mean, the thing is, he totally commits to this role. It’s almost sad to see him trying so hard when everything around is just so gosh darned mediocre. I’m glad for the warning. Even though I’m in the camp that thinks method acting can and does sometimes go too far I appreciate it when actors transform themselves in ways that give credibility and weight (no pun intended) to their performance. And that’s why I might have checked this out–but since that stretching only pays off if the ultimate result is a good movie I’ll skip it. The character really doesn’t require it whatsover. I wrote a post recently about how the cult of machoism is pushing actors into this method business when they actually just need to get better at PRETENDING, which is what acting is, not some extreme weight loss challenge. I seem to recall seeing a trailer for this. I don’t recall it being something that I wanted to see. Definitely skip, then. Excellent stuff – really enjoyed the review. Disappointed this is one to avoid, though… I had hoped for good things. Especially cause the Iggy Mouse song is so great and I saw a poster that says “McConaughey is mesmerising”.